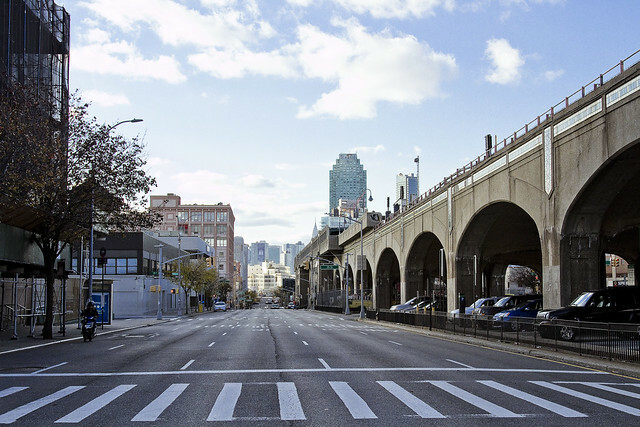 Block by block in LIC, from grave to rail. In a post last week – I mentioned that shortly after visiting the Kosciuszko Bridge construction site, the burning thermonuclear eye of God itself had managed to burn off the atmospheric gray miasma which had occluded it. As I moved inexorably northwards back to Astoria, via First Calvary Cemetery, the sky – and light – seemed to get better and better. 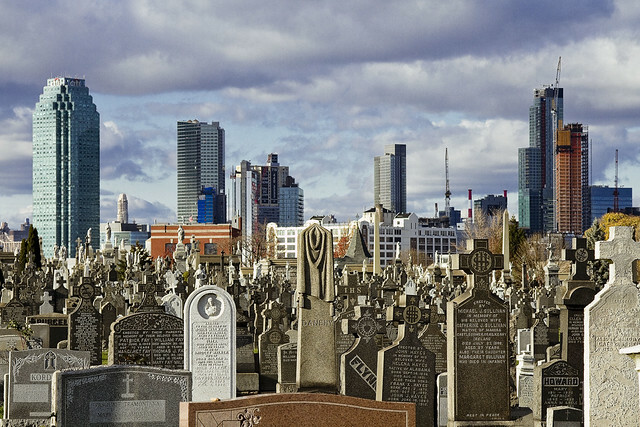 Pictured above is the skyline of the Modern Corridor of LIC, rising beyond the tombstones set into what those who lived during the colonial era would have called Laurel Hill. Note the change in elevation. 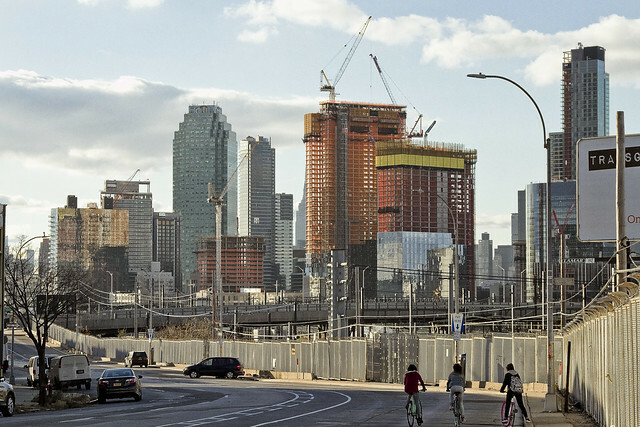 The flood plain of the East River and the Newtown Creek is what they’re built on. Back here in Blissville, the ground begins to rise as you head eastwards towards the start of the terminal moraine of Long Island in Maspeth, and the bluff which gives Ridgewood its name. That’s the main gate of Calvary Cemetery above, stout ironwork which is decorated with the fasces of the Romans. Obviously, leaving Calvary is a privilege, as most who enter it stay there forever. 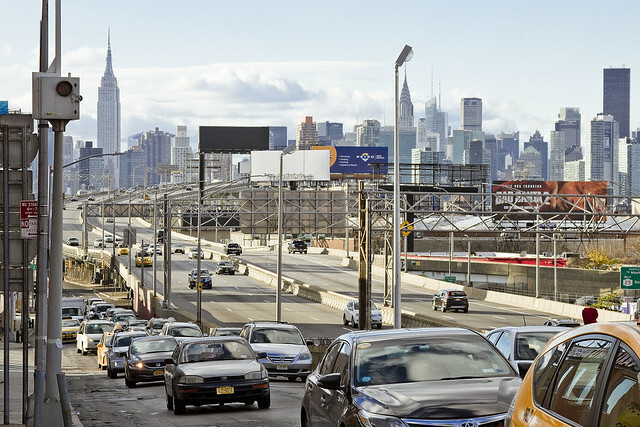 In the distance, beyond the Queens Midtown Expressway section of the world’s longest parking lot – called the Long Island Expressway (in hushed whispers) – is the Degnon Terminal. 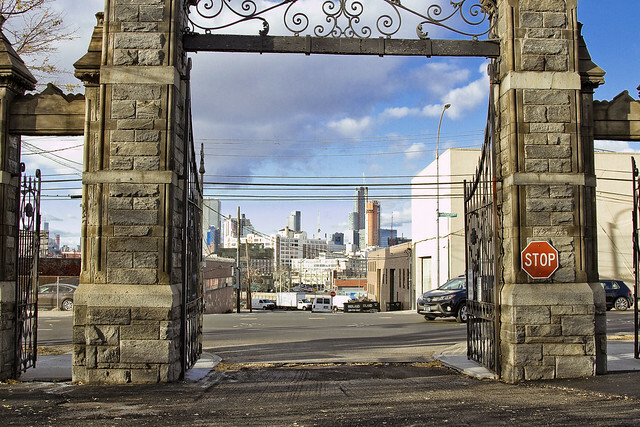 The former industrial park adjoins LIC’s tributary of Newtown Creek, called Dutch Kills. The street closest to the gates is Greenpoint Avenue. To the left, or south – is the infinity of Brooklyn. If you live in a zip code that starts with “111” you live in Long Island City. That’s the code associated with the municipality’s former holding by the United States Post Office. Using the example of the “Miracle on 34th street” movie, if th USPS says it – it’s true. I win. This used to be Hoffman Avenue, in a time during which virtually no one currently alive would remember. It’s in Sunnyside, which is the name assigned to the neighborhood surrounding Queens Blvd. shortly after the IRT Flushing Line was built and opened. The so called “Philadelphia plan” rechristened the north/south “named” streets of “Long Island City” heights, later Sunnyside, with numbers instead of names like “Bliss” or “Lowery” or “Laurel Hill Blvd.”. An east/west avenue, Skillman is named for an old farming family and provides the century old southern border for the Sunnyside Yards. There used to be a “Pest House” nearby, during colonial and early 19th century times, where sick and dying residents would be quarantined away from the rest of the population to avoid the spread of epidemics. Skillman Avenue is built on a bluff, or ridge, that used to look down on the pestilential swamps that sat between it and through which Jackson (modern day Northern Blvd.) Avenue was built. 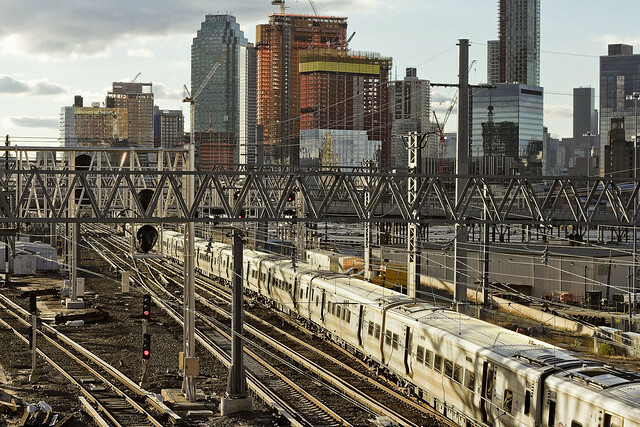 All of that changed with City consolidation in 1898, and the later construction of the gargantuan Sunnyside Yards by the Pennsylvania Railroad company at the start of the 20th century. Robert Moses renamed the stretch of Jackson Avenue that goes from 31st street to Flushing as Northern Blvd. Famously, I can describe where you’ll find every single hole in the fencing surrounding the 180 plus acre Sunnyside Yards complex is located, and the one which provided vantage in the shot above is one of my favorites. It overlooks the Long Island Railroad Main Line, which has been carrying commuters from east to west, and back again, since 1870. Love your “over there” reference. And your shot down Skillman was fabulous.